I made two extravagant purchases yesterday. Even in times of sluggish cash flow, it's important to treat ourselves extra sweetly now and then. I bought a copy of Artful Blogging magazine, just for the beauty of it. I'm going through it slowly, turning every page, savoring it like a piece of fine dark chocolate. I'm looking for something, and I don't know what it is, but I know it will find me if I make a welcoming place for it. I also bought a skein of beautiful, hand dyed, pink yarn from Weaving Southwest, which is becoming a set of felted coasters for my daughter, just because I think she should have them. 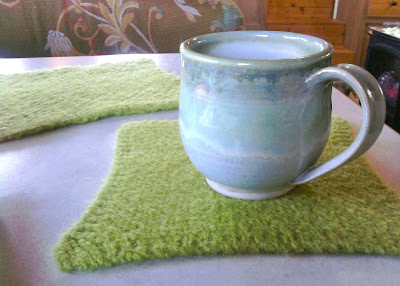 This week I am suddenly, inexplicably obsessed with these coasters. 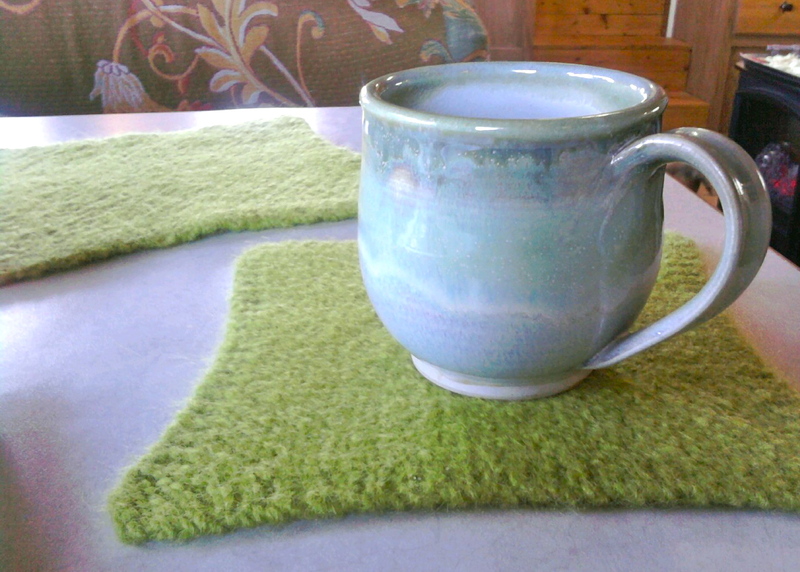 I see no potential for profit in this excursion, but I'm so enjoying the beautiful yarns, the process from knitting to hand felting in hot soapy water, and the soft, finished mats, cushioning my cup, keeping it from clunking and grating on the table. It's a simple pleasure, but extravagant in that there's no money in it. That just has to be OK right now. 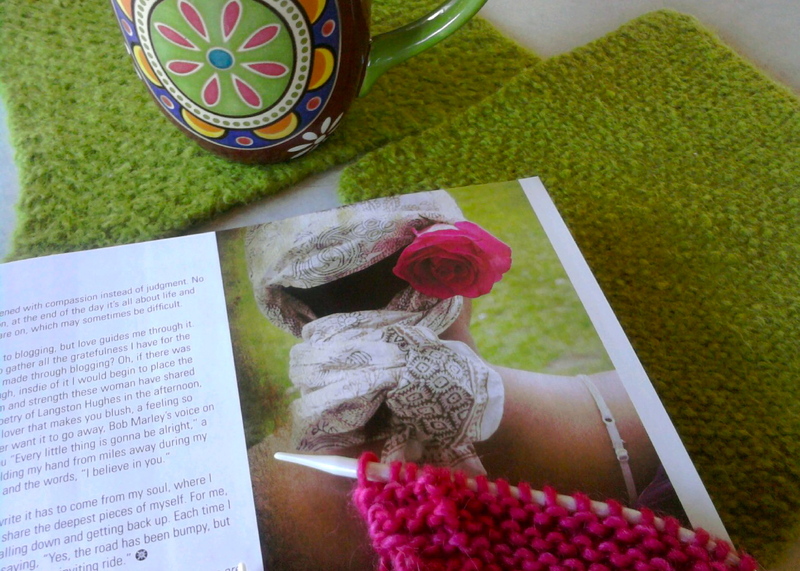 This morning I was slowly knitting the pink yarn, and sipping tea, and as I glanced at the new magazine, I noticed a beautiful color connection between that moment in my day, and the open page in front of me. I'm watching for connections and synchronicities these days, watching for signs and encouragement. It was like I fell into that magazine for a moment, or it expanded out to greet me. There is magic in moments like that, where extravagance becomes a comfortable part of reality, rather than an infrequent guest. I have a tendency to be stingy with myself, and I think the Universe responds to that by saying, Oh, you want nothing? OK! Here it is--nothing! It's true that I'm happiest in a simple life, without the burden of too much stuff. But I'm starting to understand that surrounding myself with simple things of beauty will encourage more beauty to come looking for me. Maybe extravagance isn't extravagant at all. Maybe it's important now and then to say to ourselves, Hey, I like you! Here's something nice, just for you. A magazine and yarn and coasters aren't going to change the world, but they're a step in the process--in my process--and I'm happy to have them here, keeping me company today. thank you for the mention of my blog. it just warms my heart to know, the article has brought me a new blogging friend. I love the color of the yarn, love the coaster, love that you gave yourself those gifts, would love to read that magazine of yours and love the changes you made to your blog - very artful and kind of southwestern. Take care! And a lovely pink it is...... Your daughter will love them! Thanks for the comments! 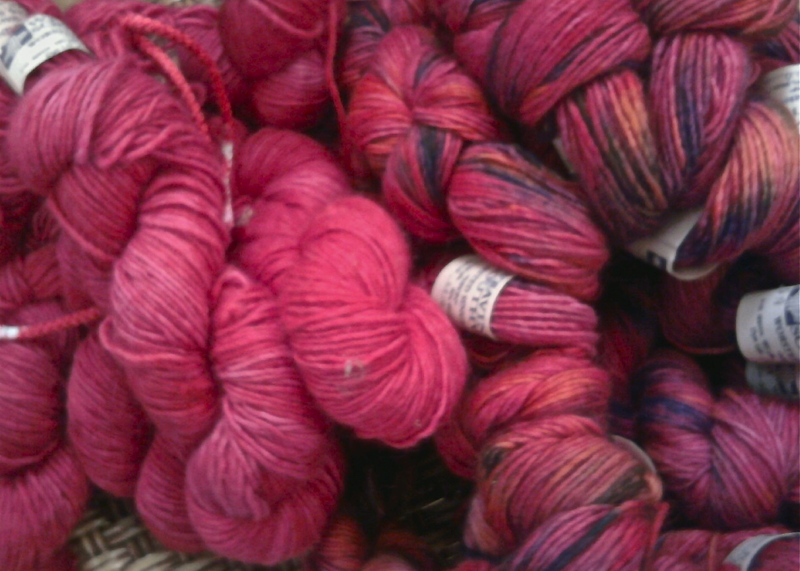 Rick says he might bring me yarn instead of flowers sometimes. I like the idea! What a beautiful Blog you have here - and I really needed to read this one! thanks for reminding me that I need something too, once in a while..